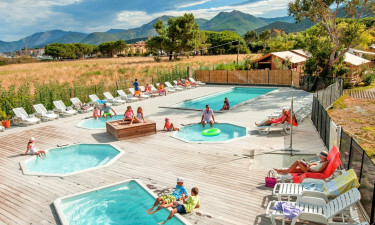 Kalliste campsite is ideally located near a river and a beach, while also just 700 metres from the town centre of St Florent in the north of Corsica. Kalliste offers a unique location for visitors to enjoy a quiet holiday, close to nature. Set in the midst of a rural idyll, this site will allow you to enjoy the wonders of Corsica including its culture and scenic landscape with impressive views. Various water sports are available locally. An ideal base to discover the marvellous beaches, mountains and villages of North Corsica. The many facilities at Kalliste Camp include a new heated swimming pool, a whirlpool, solariums, a children's play area, a TV Room, petanque (similar to boules), ping-pong, adventure playgrounds and a Kids Club (6-11 years). As a luxury camping site, all accommodation is of a very high standard. With LUX-camp, luxury camping makes your holiday enjoyable and stress-free. You can choose from a range of luxury mobile home options. 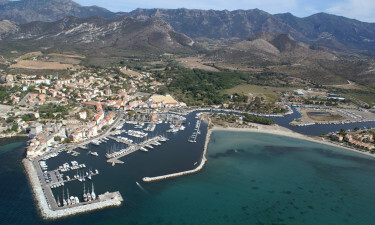 You may like to visit a citadel, dating from 1440 AD and the prevailing 'balcony' villages of the Gulf of St-Florent. Every summer in July, the streets are filled with the sound of music with the Festival ""Les Nuits de la Guitare"". Alternatively, you may be tempted to discover Nebbiu, a mysterious country often covered with mist. There is also the Wine Route with 33 wineries in the Corsican micro-region. Nature lovers will be particularly interested in spotting the rare Hermann tortoise that can sometimes be seen on the thyme-strewn Corsican slopes - or the Drosera Rotundifolia, a rare and flowering carnivorous plant. The area is rich in leisure activities to suit every taste, such as sailing, fishing, water skiing, diving and sail boarding. Or how about hiking and paragliding? Alternatively, you could simply enjoy relaxing and sunbathing on of the many nearby gorgeous Mediterranean beaches. Kalliste Camp is the ideal location for a family camping holiday as there is something to suit every taste. At Kalliste Camp, a bakery delivers fresh bread every day. 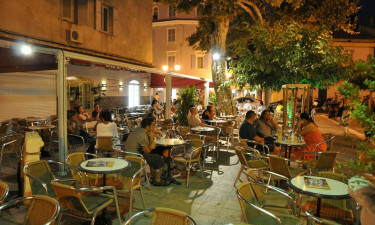 There is a restaurant and a take away service on the campsite or you could discover the local Corsican cuisine. Look out for Corsican charcuterie - coppa, lonzu and figatellu – or Corsican cheeses, such as brocciu and calinzana. The canistrelli, or biscuits, are always tempting and Corsican honey is famous.